RTG's Orc vs Elf Slot Information, Betting options, Bonus features and the various symbols used. Also find out at which RTG online casinos the Orc vs Elf Slot can be played. Orc vs Elf is a 5 Reel, 25 Payline 3D video slot, introducing the new Super Spin option and 14 Bonus features. Based on mythical creatures from many fictional stories – journey to Middle Earth where 2 species battle for ultimate supremacy. Before the game begins players must take sides, embarking on either the The Road to Elveros or The Trail to Orcholome. The Orc Wild appears only on the 1st reel substituting for all other symbols except the Elf Shield Scatters to create winning combinations. The Elf Wild appears only on the 5th reel a substituting for all other symbols except the Orc Shield Scatters to create winning combinations. The Scatters help to trigger many of the Bonus features. 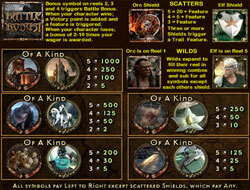 3 Orc Shields or 3 Elf Shields in any position will award Scatter payouts and trigger one of the 14 Bonus features. There are 7 Orc features available on The Trail to Orcholome and 7 Elf features available on The Road to Elveros. 3 Bonus symbols appearing anywhere on reels 2, 3 or 4 will trigger the Battle Bonus round. The Orc and Elf battle it out on the screen awarding instant prizes and multipliers. Hobgoblin - Win 6 Free Spins – land 2 Orc Shield Scatters during free spins to receive an additional free spin. Orc Army – Win 6 Free Spins - if the Orc symbol appears an extra Wild symbol will be awarded. 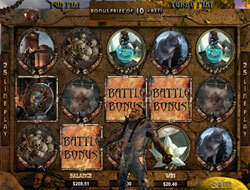 Orc Horde - Win 6 Free Spins with an extra Wild added to the 1st reel. Chaos Spins - Win 7 Free Spins with some symbols on the reels paying out 3x when forming part of a winning combination. Orc Onslaught - Win 7 Free Spins with the final spin acting as a Super Spin. During the Super Spin, the Orc symbol covers Reel 1. Woodland - Win 6 Free Spins. Elf Magic - Win 6 Free Spins with an extra Wild symbol appearing on Reels 2, 3 or 4. Huntsman - Win 7 Free Spins - the Elf will try killing any Orc symbols appearing on reel 1 which could result in a 200x bet payout. Ancient Archer - Win 7 Free Spins - the Elf targets both the Orc and Wolf symbols. Killing the Orc will payout 200x the bet and the Wolf payout is 100x the bet. Archmage - Win 7 Free Spins and 1 or 2 Extra Wilds get added to the reels after every spin. Forestal - Win 7 Free Spins and earn a Free Super Spin when landing an Elf symbol across the reels. 3 Extra Wilds get added after each Super Spin. Elf King - Win 8 Free Spins and any Super Spin, land an Elf symbol across the reels to get a 4th Extra Wild after every Super Spin. This is certainly a Game Changer with a mystical and exciting atmosphere; players who are fond of fantasy themed slots will love this game! There is so much variety with the bonus features and free spins.